Background: Volatile sulfur compounds (VSCs) produced inside the mouth are a well-known cause of halitosis. Recent studies have suggested that VSCs modify the pathology of periodontitis by encouraging the migration of bacterial toxins associated with increased permeability of gingival epithelia, and enhancing the production of matrix metalloproteinases in gingival connective tissue. Nonetheless, the effects on the enamel of direct exposure to VSCs within the oral cavity remain unclear. In the present study, we observed the effects of VSCs in the form of hydrogen sulfide (H 2 S) on enamel surfaces and determined their effects on restorations. Materials and Methods: Extracted human tooth and bovine tooth samples were divided into the H 2 S experimental side and the control side. We observed the effects of H 2 S on enamel surfaces using electron microscopy and conducted a shear test. Results: We found that exposure to H 2 S obscured the enamel surface's crystal structure. The surface also exhibited coarseness and reticular changes. Shear testing did not reveal any differences in bond strength. Conclusions: Our findings suggested that H 2 S occurring inside the mouth causes changes to the crystal structure of the enamel surface that can lead to tooth wear, but that it does not diminish the effects of dental bonding in adhesive restorations. Objective: The purpose of this study was to evaluate the thermal insulating properties of different light curing cavity liners and composite resins during light emitting diode (LED) curing. Materials and Methods: Sixty-four dentin discs, 1 mm thick and 8 mm in diameter, were prepared. Specimens were divided into four groups. Calcium hydroxide (Ca[OH] 2 ), resin-modified glass ionomer cement, flowable composite and adhesive systems were applied to dentin discs according to the manufacturers' instructions. The rise in temperature during polymerization with a LED curing unit (LCU) was measured using a K-type thermocouple connected to a data logger. Subsequently, all specimens were randomly divided into one of two groups. A silorane-based composite resin and a methacrylate-based composite resin were applied to the specimens. 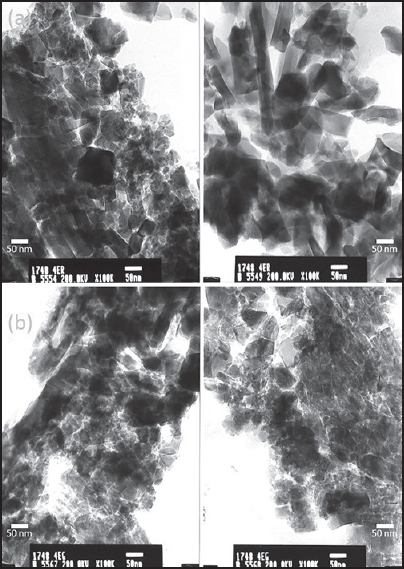 Temperature rise during polymerization of composite resins with LCU were then measured again. Data were analyzed using one-way ANOVA and post hoc Tukey analyses. Results: There were significant differences in temperature rise among the liners, adhesives, and composite resins (P < 0.05). Silorane-based composite resin exhibited significantly greater temperature rises than methacrylate-based resin (P < 0.05). The smallest temperature rises were observed in Ca(OH) 2 specimens. Conclusion: Thermal insulating properties of different restorative materials are important factors in pulp health. Bonding agents alone are not sufficient to protect pulp from thermal stimuli throughout curing. Aim: To evaluate the apical transportation induced by two instrumentation techniques in severely curved simulated canals. Materials and Methods: Forty simulated canals were divided into two groups (n = 20), according to the following instrumentation techniques: ProTaper Universal Manual System and a hybrid technique. The simulated canals in the ProTaper group were prepared following the technique recommended by the manufacturer: SX files in the cervical third of the root canal and S1, S2, and F1 files up to the working length. In the hybrid group, preparation was performed with K-files sizes 15, 20, and 25 to the working length, followed by cervical preparation with Gates Glidden burs 1, 2, and 3. Apical finishing was performed with the ProTaper manual files S2 and F1. To analyze apical transportation, the simulated canals were photographed before and after preparation at ×8. The images of the root canals pre- and post-instrumentation were superimposed to measure the distance between the inner and outer walls along the first 3 mm of the apical third. Results: The hybrid group presented the highest apical transportation values; however, with no statistically significant difference in comparison with the ProTaper group (P > 0.05). Conclusions: Both techniques induced similar apical transportation in the original path of the simulated root canals. 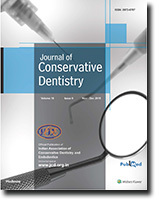 Aims: This study evaluated the biocompatibility of the Indian Portland cement with potential for use in dentistry. 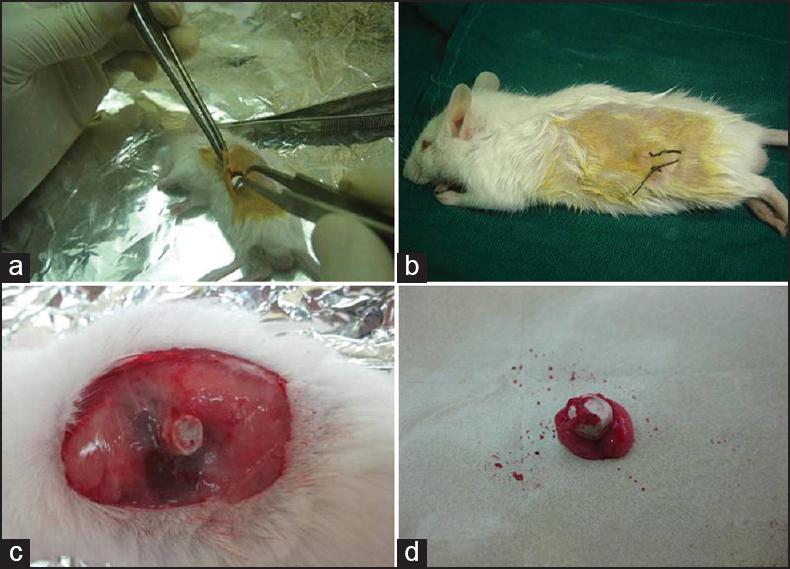 Materials and Methods: This study was performed in Swiss albino mice, by implanting the Indian Portland cement pellets subcutaneously. After 1, 3, and 6 weeks the tissue specimens were prepared for histological examination. Results: The histological analysis showed moderate to severe inflammation at 1 week. The inflammation gradually decreased by 6 weeks, with most of the specimens showing the absence of inflammatory reaction. Conclusions: According to these experimental conditions, the tested Indian Portland cement was biocompatible. Aim: To evaluate the sealing ability of ProRooT MTA, RetroMTA, and Biodentine as furcation repair materials using dye extraction leakage method. Materials and Methods: Thirty-five mandibular molars were randomly divided into four groups according to the material used for perforation repair. Group I - ProRoot MTA (10 samples), Group II - RetroMTA (10 samples), Group III - Biodentine (10 samples), and Group IV (Control) - left unrepaired (5 samples). All samples were subjected to orthograde and retrograde Methylene blue dye challenge followed by dye extraction with concentration 65% nitric acid. Samples were then analyzed using ultraviolet-visible spectrophotometer using 550 nm wave lengths. Statistical Analysis: One-way analysis of variance, Tukey-Kramer multiple comparisons test. 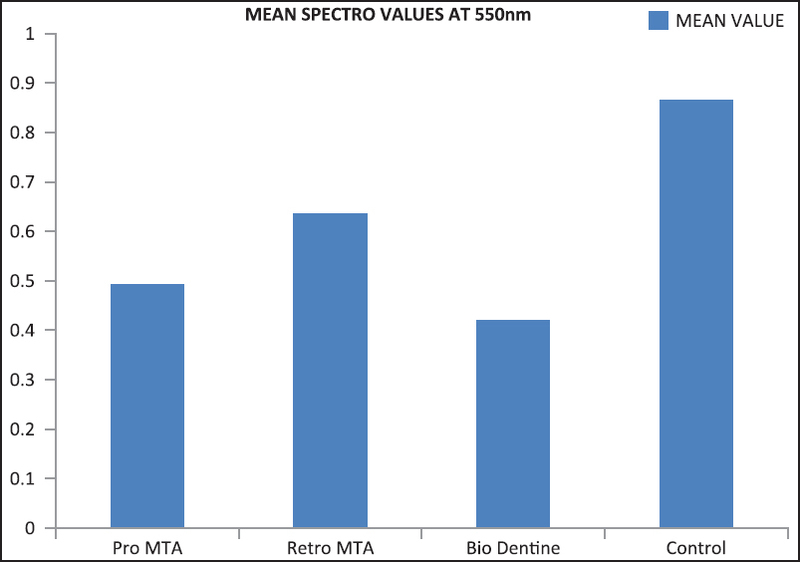 Results: Biodentine showed least dye absorbance while RetroMTA showed highest dye absorbance values when compared with other repair materials. Conclusion: Within the limitations of this study, it was observed that Biodentine showed better sealing ability when compared with other root repair materials. 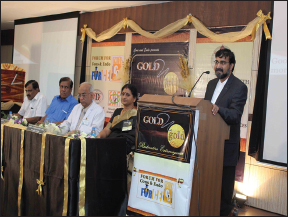 Aims: Comparative evaluation of EQUIA with a resin-modified glass ionomer cement (RMGIC; GC Gold Label glass ionomer light cured universal restorative cement) and a nanohybrid composite (Tetric N-Ceram) in noncarious cervical lesions (NCCLs). Background: To establish the most suitable material for the restoration of NCCLs. Settings and Design: In vivo study. Materials and Methods: Eighty-seven NCCLs were randomly restored with EQUIA, a RMGIC, and a nanohybrid composite. Clinical evaluation of the restorations was done following the Unites States Public Health criteria by a single-blinded investigator. Data were formulated, and statistical analysis was done by Chi-square test. Statistical Analysis Used: Chi-square test. Results: No significant difference was found between EQUIA, RMGIC, and nanohybrid composite at 1-month, at 6 months, and at 1-year (P > 0.05). Conclusions: EQUIA, resin-modified glass ionomer, and nanohybrid composite performed equally at 1-month, 6 months, and 1-year follow-up periods. Aim: To compare the fracture resistance exhibited by teeth after primary endodontic treatment and retreatment. Materials and Methods: One hundred freshly extracted human teeth were selected. 20 samples served as control (untreated). Eighty experimental samples were divided into two groups (n = 40) for instrumentation using rotary Protaper NEXT (PTN) or reciprocating WaveOne (WO) files and obturated using warm lateral compaction. Half of the samples (n = 20) from each group were subjected to a load. The remaining half were subjected to retreatment using Protaper universal retreatment files (RFs) followed by a file larger than the master apical file used in groups 1 and 2 and reobturated. Group A: Control, Group B: PTN + obturation, Group C: WO + obturation, Group D: RF + PTN + obturation and Group E: RF + WO + obturation. The retreatment specimens were also subjected to load and the readings acquired were statistically analyzed. Result: When compared between the groups, control group exhibited the highest fracture resistance (P < 0.01). 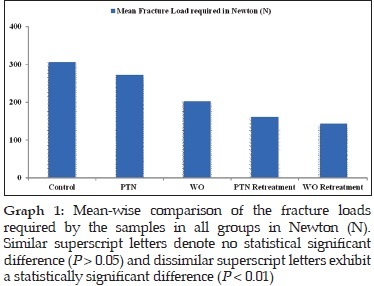 When multiple tests were performed, Group E exhibited significantly less fracture resistance (P < 0.01). Conclusion: Endodontic treatment and retreatment both results in lowering the fracture resistance of a tooth. Background: This study was conducted to evaluate in vitro antibacterial potential of ethanolic extract of Calotropis gigentica. Materials and Methods: The inhibitory effect of the ethanolic extract was tested against Streptococcus mutans and Lactobacilli casei by using disc diffusion method. Results: Ethanolic extract of Calotropis gigentica showed 16 mm and 14 mm of minimum inhibition zone at 1.25% concentration for S. mutans and lactobacilli, respectively. Conclusion: Calotropis gigentica was found to effective against S. mutans and lactobacilli. Aims: To check the antimicrobial activity of Azadirachta indica (Neem), Mimusops elengi (Bakul), and Chlorhexidine gluconate (CHX) on multispecies biofilm of common endodontic pathogens such as Streptococcus mutans, Enterococcus faecalis, Staphylococcus aureus and Candida albicans. Settings and Design: In vitro dentin disinfection model used to check the antimicrobial efficacy of herbal extracts. Materials and Methods: The in vitro dentin disinfection model was used to check the antimicrobial activity of the methanolic extracts of the medicinal plants along with Chlorhexidine gluconate. The polymicrobial biofilm was allowed to grow on extracted teeth sections for a period of 21 days. Remaining microbial load in the form of CFU/ml after the antimicrobial treatment was tabulated, and data were statistically analyzed using ANOVA and Bonferroni post-hoc tests. Statistical Analysis Used: SPSS version 17, one-way ANOVA, Bonferroni post-hoc test. Results: Both the plant extracts showed considerable antimicrobial efficacy as compared to negative control. 2% CHX was the most effective antimicrobial agent having statistically significant difference against plant extracts and negative control (saline). Conclusion: The methanolic extract of A. Indica, M. elengi, and Chlorhexidine Gluconate has considerable antimicrobial activity against polymicrobial dentinal biofilm of S. mutans, E. faecalis, S. aureus and C. albicans. Aim: To investigate the effect of salivary contamination on the bond strength of two different seventh generation adhesive systems. 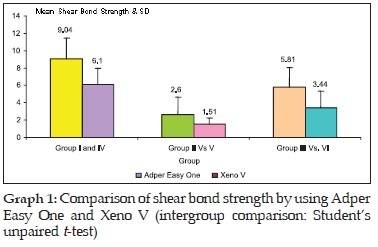 Materials and Methods: Sixty caries-free human premolars with flat dentin surfaces were randomly divided into six groups of 10 teeth each and bonding was done using seventh-generation bonding agents Adper Easy One (3M ESPE) and Xeno V (Dentsply). Following the bonding procedure, resin composite was bonded to the surfaces using a plastic mould. The prepared specimen with composite cylinders attached were placed in 37°C distilled water for 24 h and then subjected to shear bond strength (SBS) with 0 h universal testing machine and the data were subjected to one-way analysis of variance and unpaired t-test. Results: Statistical significant difference between the Groups I, II and III in which Adper Easy One was used and similarly for Groups IV, V, and VI in which Xeno V was used. When an intergroup comparison was made using unpaired t-test Group II and Group V showed the nonsignificant difference. Conclusion: Salivary contamination significantly affects the SBS of both the seventh generation dentin bonding agents. However, 2-hydroxyethyl methacryate based adhesive has higher bond strength. Background: Root canal sealers help to minimize leakage, provides antimicrobial activity to reduce the possibility of residual bacteria, and to resolve periapical lesion. 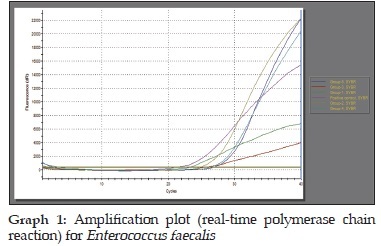 Aim: To compare five different root canal sealers against Enterococcus faecalis in an infected root canal model by using real-time polymerase chain reaction (RT-PCR). Settings and Design: Sixty human mandibular premolars were sectioned to standardize a uniform length of 14 mm. Fifty microliters of the inoculum containing E. faecalis were transferred into each microcentrifuge tube (n = 60). The samples were divided into six groups Tubli-Seal, Apexit Plus, Fillapex, AH Plus, RoekoSeal, and Positive control, respectively. Materials and Methods: Five groups after the incubation with the microorganism E. faecalis were coated with different root canal sealers and obturated using F3 ProTaper Gutta-percha point. The dentinal shavings were collected and analyzed for RT-PCR. Statistical Analysis: The mean difference between six groups was calculated using analysis of variance and post-hoc test. Results: The highest antibacterial activity was achieved with Tubli-Seal (1938.13 DNA in pictogram [pg]) and least by RoekoSeal (3034.54 DNA in pg). Conclusion: The maximum antimicrobial activity was achieved AH Plus and Tubli-Seal. RT-PCR can be used as a valuable and accurate tool for testing antimicrobial activity. Aim: To evaluate the effect of the addition of 2% chlorhexidine on the sealing ability of Biodentine. 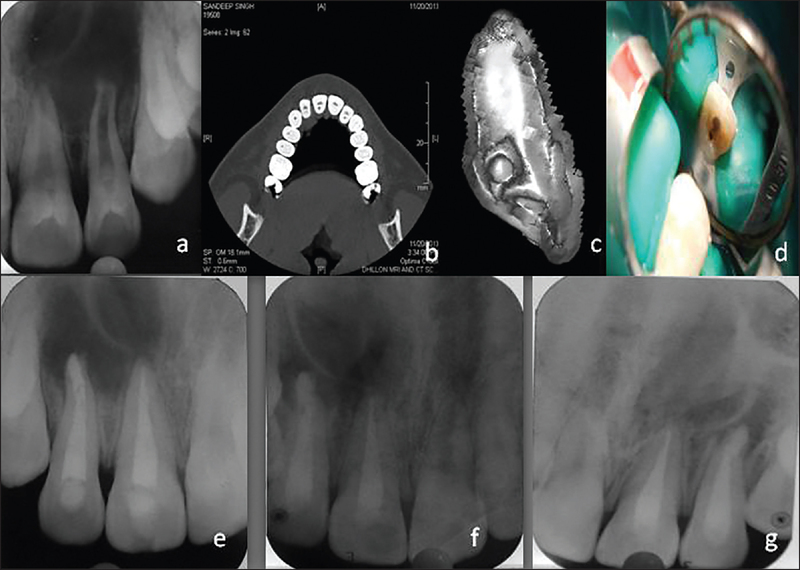 Materials and Methods: Forty-six extracted human premolar teeth with single canal and apical foramen were selected, cleaned, and decoronated to standardize the length of 17 mm. Canals were prepared using ProTaper rotary files till size F4. The samples were divided into 2 experimental groups of 20 samples each on the basis of absence/presence of 2% chlorhexidine in liquid: Group B M = Biodentine mixed with the provided liquid, Group B C = Biodentine mixed with 2% chlorhexidine in provided liquid. Three samples, each were assigned to control groups: Group B P (positive control) = No root end filling was placed, Group B N (negative control) = Root ends were filled as in Group B M, and entire external surface was coated with sticky wax. The samples were then evaluated for the apical sealing using fluid filtration method. Results: Results were analyzed using Student's t-test (P ≤ 0.05). Group B C showed the better sealing ability (3.06) as compared to Group B M (3.85). However, the difference was statistically insignificant (P > 0.05). Conclusion: Addition of 2% chlorhexidine to the liquid enhanced the sealing ability of Biodentine. Objective: Bleaching agents may affect the properties of dental materials. The aim of this study was to evaluate the effect of different polishing techniques on the surface roughness of composite resins submitted to the at-home and in-office bleaching treatment. Materials and Methods: Disc-shaped specimens were carried out of nanofilled and microhybrid composites (n = 10). Finishing step was performed after light curing (L1) and polishing after 24 h with two systems (L2). Then, specimens were submitted to the home or in-office bleaching procedures, and roughness was re-evaluated (L3). The surface roughness (Ra) readings were measured at L1, L2, and L3 times using a profilometer. Data were statistically analyzed by multiple-way analysis of variance and Tukey test (α = 0.05). Results: The polishing procedures decreased Ra for both composites compared to baseline values (L1). The roughness of specimens polished with jiffy did not present significant difference after polishing step (L2) and bleaching treatment (L3). 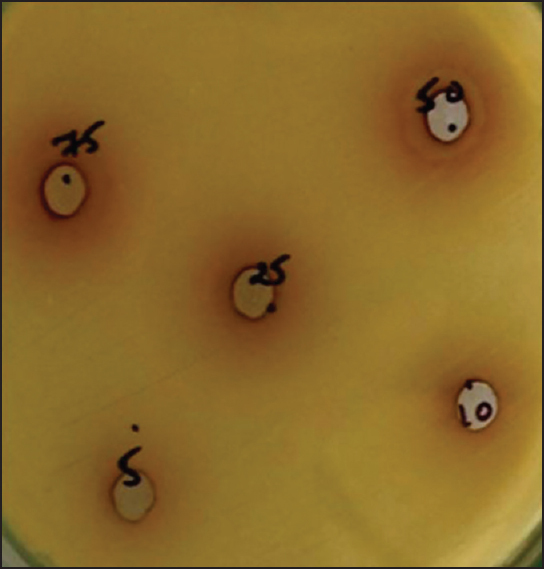 However, the groups polished with Sof-Lex discs had increase on the Ra values after bleaching. Conclusion: The polishing is an important procedure to reduce the roughness of dental restorations and composite surface polished with jiffy system improved the degradation resistance to the bleaching agents compared to Sof-Lex discs. Context: The complexities of the oral environment, the dentin substrate, and the different bond and composite resin systems represent a challenge to the maintenance of reasonable bond between the composite resin and the tooth structure. Aims: To evaluate the effect of the adhesive system on bond strength between silorane-based composite resin and dentin. Materials and Methods: Fourteen human molars extracted were selected and vertically cut into 3 dentin fragments, randomly divided among the experimental groups and restored with Z250 and P90 composite resin using different adhesive protocols (Adper Single Bond 2, Silorano primer, Adper SE Plus, and Scotchbond Multiuse). Two composite resin cylinders were built up on each dentin surface (n = 10) and subjected to a micro-shear bond strength test. Statistical Analysis Used: Kruskal-Wallis one-way analysis of variance and Tukey test (P = 0.05). Results: According to the results, Kruskal-Wallis test evidenced at least one statistical significant difference (P = 0.001). The Tukey test showed statistically significant differences among the group (P < 0.05). Group PSM8 (P90 + SM) showed statically significant higher results when compared with groups PSP4 (P90 + SP), PSB2 (P90 + SB), and ZSE5 (Z250 + SE). Conclusion: The results evidenced that the monomer of the adhesive system has an effect on bond strength between the composite resin and dentin. Dens invaginatus is a rare malformation with a widely varied morphology. It typically affects permanent maxillary lateral incisors, central incisors, and premolars. This article demonstrates rapid management of type II dens invagination with open apex and large periradicular lesion using calcium hydroxide as intracanal medicament for 1-week followed by apical plug formation with mineral trioxide aggregate Plus and lateral condensation of Gutta-percha. 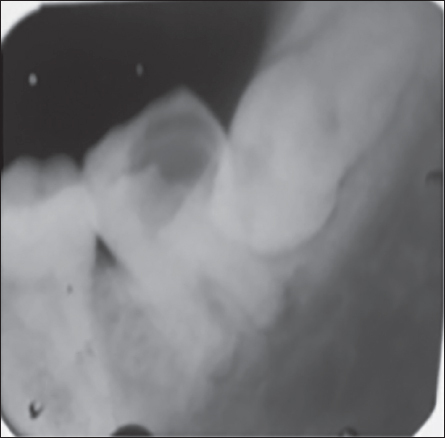 At 24-month follow-up, the patient was asymptomatic and lesion was entirely resolved. An immature maxillary first premolar in an 8-year-old female was treated using a regenerative approach. The root canal was gently irrigated with 5.25% sodium hypochlorite without instrumentation under aseptic conditions and then medicated with calcium hydroxide (Ca[OH] 2 ) for 3 weeks. The Ca(OH) 2 was removed, and bleeding was initiated mechanically using a hand file to form an intracanal blood clot. Mineral trioxide aggregate was placed over the blood clot, and the access cavity was sealed with a double filling. 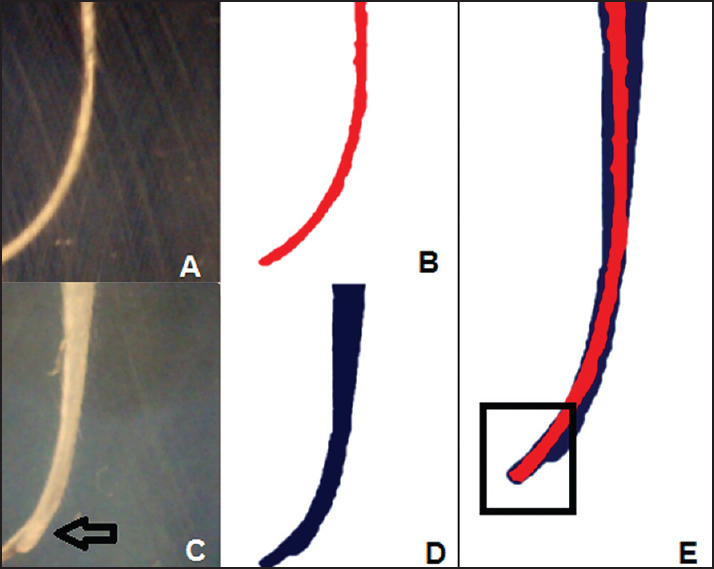 Increases in root length and width were radiographically evident, at the 6-month follow-up exam. The case was followed for 3 years. The development of 3 roots with complete apical closure was confirmed using cone beam computed tomography. Autogenous tooth transplantation refers to the repositioning of autogenous teeth in another tooth extraction site or a surgically formed recipient site to replace missing teeth due to congenital deformity, grossly decayed carious teeth, mobile teeth due to periodontal disease, teeth lost due to trauma, endodontic failure or any other reason when a suitable donor tooth is available. This is a case report of autotransplantation of impacted #38 with complete root formation into the extraction site of grossly decayed, unrestorable #37 with 18 months follow-up showing excellent periapical healing and tooth stability. In autogenous tooth transplantation, even if the donor's tooth has complete root formation, a high success rate can be achieved if the cases are selected and treated properly. 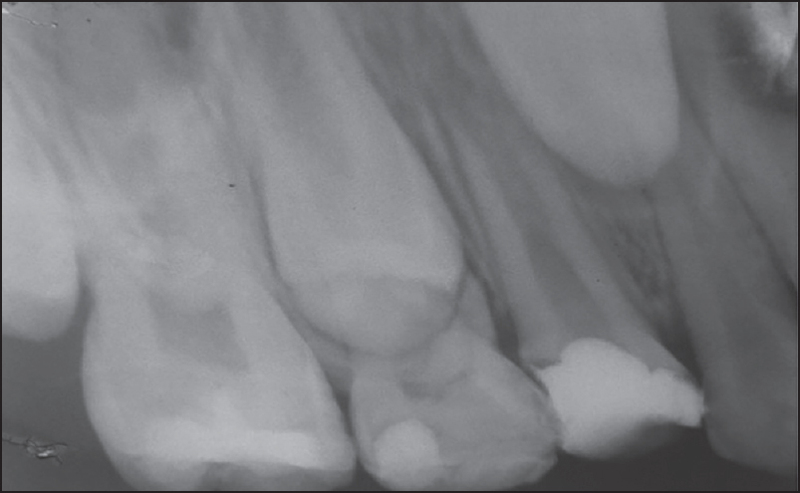 Chances of root resorption are there because of necrotic pulp and periodontal irritation during manipulation. However, autogenous tooth transplantation should always be considered as a good treatment modality in feasible cases.